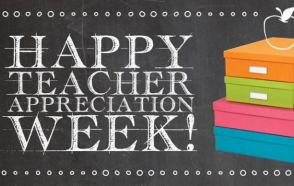 It’s Teacher Appreciation Week! Most of us can name several teachers from pre-K through high school who have left lasting positive impressions on us. I know I could name half a dozen at least who shaped who I am in various ways. There was my fourth-grade teacher who read us books with strong female protagonists and gave us real feedback on our work (“You’re a better writer than this. Find a more creative way to say what you mean”). There was my sixth-grade science teacher who ran an afterschool club focused on community service and taught us about protecting the environment. Then there was my eighth-grade history teacher, who encouraged us to do independent research projects and supervised the student government. When I came to her with an idea for a school-wide event, she could have easily said no or redirected me to a less ambitious project. Instead, she guided my friends and me as we made blueprints, presented at staff meetings, called organizations asking them to sponsor us, recruited parent volunteers and eventually pulled the whole thing off, learning a lot about ourselves in the process. For us, she was more than a teacher- she was a mentor who believed in us during those tumultuous preteen years when we weren’t sure we believed in ourselves. “Consider funding a local classroom project on DonorsChoose.org. The organization connects teachers in high-need communities with donors who want to help. Projects can range from distributing basic art supplies to iPads for the classroom. Connect with your child’s school PTA group and offer to collect supplies or funds for their classroom, or even offer to clean or help decorate their classroom. Every teacher appreciates when parents or caretakers can pitch in a few hours. Offer to cater lunch for teachers at a local school on a Friday. They’ll appreciate the break, and it’s a great way to get involved as a local business. Send a handwritten note of appreciation to your child’s teacher. A simple note can help brighten a teacher’s day.